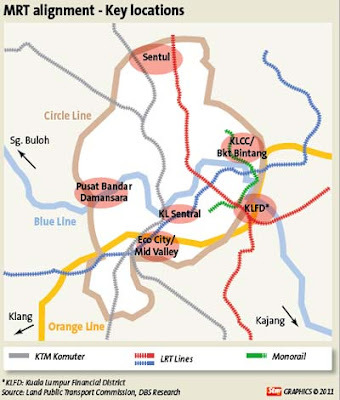 The RM12.2b Klang Valley MRT (Blue Line). This post was previously posted here. The recent display of the MRT Blue Line (Sungai Buloh - Kajang) is a clear sign of confidence and commitment that Syarikat Prasarana Negara as well as Land Public Transport Commission (SPAD) have in the execution of the construction and completion of this MRT. The MRT Blue Line - which goes from Sungai Buloh all the way to Kajang, spans about 51km, reduced slightly from before. According to the information shown, 9.5km out of this 51 km will be underground, whereas the balance will be elevated (or ground level I guess). The estimated costs of the Blue Line... if benchmarked at a cost/km of RM240million - would cost about RM 12.24 billion. =) As for the tunnel portion of 9.5km, if benchmarked at RM325million per every km, that portion would be worth about RM3.1billion. According to press reports, the Government is expected to acquire about 473 plots of land along the MRT route - totalling about 97 hectares of land for the Blue Line. The breakdown of these acquisition is about 103 lots will be acquired between the Sg Buloh and Semantan (Damansara Heights) stretch, 163 lots over the underground section running from Semantan towards the city and 207 lots along Maluri to Kajang town. Existing land usage along the proposed alignment includes residential, commercial, industrial, institutional and recreational uses. Significant stretches, especially segments passing through secondary business hubs and the central business district, are mainly commercial in nature. My immediate concern here is the timely approval by the local authorities with regards to the stations and alignments. Do note that the MRT Blue Line would go through Majlis Perbandaran Selayang (MPS), a little bit of Majlis Bandar Shah Alam (MBSA), a major part of Majlis Bandar Petaling Jaya (MBPJ), Dewan Bandaraya Kuala Lumpur (DBKL), a little bit of Majlis Perbandaran Ampang Jaya (MPAJ) and of course, Majlis Perbandaran Kajang (MPKj). Some of the information as obtained from online. The 35 stations along the Blue Line will be positioned near these plots of land. One of the stations will be built near the Warisan Merdeka Development, a project that includes a mammoth controversial 100-storey skyscraper. At least 20 listed property players have parcels of developed and undeveloped land along the Blue Line - some of these to benefit potentially includes MRCB, Berjaya, Sunway City, Guocoland, Malton, YTL, Selangor Properties just to mention a few. Like what I said before recently, this MRT Blue Line is expected to increase the capital appreciation of its surrounding properties tremendously. Prices of properties are already on the upside due to higher building material prices and so on - and having this MRT just makes it sweeter for the land owners/developers. By the looks of things and news reports, the tenders for this MRT is to be called - earliest also April 2011. The Government has targetted to commence work in July 2011 - hence I believe the earliest also would be April 2011 to call tender, and awarded by June/July. However, this rush also mean that perhaps only the general earthworks and site preparation works can be started - rather than the major civil works as those would require a more in-depth study on all logistics, traffic diversion as well as land acquisition matters. With the Blue Line targetted to be completed in 2016 to operate a daily ridership of over 400,000, I trust that the public transport usage would be increased substantially, but I dont have the percentages with me though. 2011-2016 - that is about a 5 year contract period - making the Blue Line a fast-track project. There will be two other MRT lines that will be announced within the next 3 months - being the Circle Line as well as the Green/Red Line. Some of the key locations within the MRT alignment. I guess this post needs a little disclaimer. Note: This post represents the personal opinion of Eric Yong only (Yes, it is all my personal opinion/thoughts) - and does not represent a recommendation to buy the stocks of the abovementioned public listed companies. Thank you.